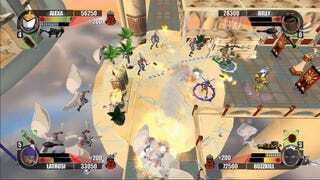 Capcom has announced it will be bringing the expansion to Rocketmen: Axis of Evil to the North American PlayStation Store tomorrow with the Xbox Live Arcade version hitting today. Rocketmen: It Came From Uranus will set interested gamers back 400 Microsoft Points or $4.95 USD depending on your console of choice. You will, as with most expansions, need the original release. Full details on what's included in It Came From Uranus is after the jump. • Continue the Rocketmen saga with your characters from the original game. • Blobber: Shoots blobs of goo at enemies, does damage over time in the part of the ground that it covers. • Beamer: Shoots lighting at enemies, does high intensity damage. • Bomber: Shoots grenades instead of bullets; grenades explode on impact doing damage. • Level 11 - Finding Jane: The player must escape the Saturnian prison mine and reclaim Nick's ship, the Icarus Jane. • Level 13 - The Plan: The player must make his way through the Saturnian palace and convince Angelica, leader of the Saturnians, to join the Alliance.